Voted as the 2016 Motor Yacht of the Year at the World Superyacht Awards, Savannah is now available for charter with Edmistion. 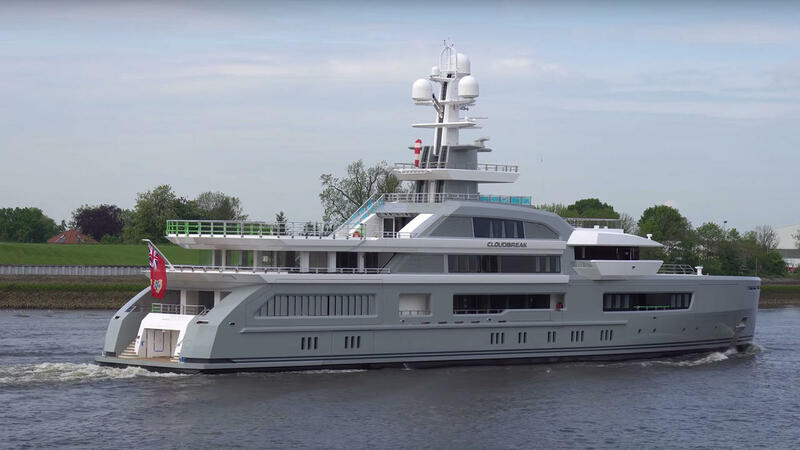 Launched in 2015 by Feadship as its first hybrid yacht, she boasts a Wartsila diesel electric powerplant that enables her to travel up to 14,000 nautical miles. Her green credentials are extensive, as she has a seafoam green exterior that complements her eco-friendly Breathe propulsion system. Developed in house, the hybrid system draws on a 30 tonne lithium-ion battery bank. Her stunning interior was created by CG Design and features soft curves and modern accents throughout. The innovative use of glass, stonework and rich woods — not to mention the 50 sliding doors — makes her interior truly groundbreaking. Key features include an underwater observation lounge, a fully-equipped gym and a spa complete with Hammam, masseuse and beautician. Savannah can accommodate up to 12 guests in six spacious cabins. On deck there’s a gorgeous swimming pool offering breath-taking views, surrounded by loungers and stretching out into a circular interior lounge. She also boasts a vast Jacuzzi, an on board basketball court, four mountain bikes, three tenders and an astonishing number of water toys. One of the best Feadship superyachts of all time, Savannah is available for charter in the Caribbean and her weekly rate starts from €1,000,000. 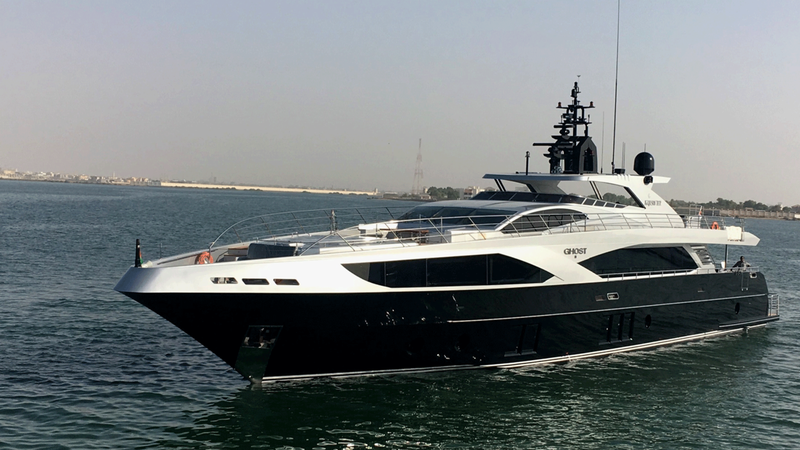 The newly launched 33.4 metre Narvalo motor yacht is now available to charter with Y.CO. Built by Cantiere delle Marche and delivered this year (2016), Narvalo is the latest in the shipyard’s Nauta Air Explorer series, designed for long expeditions to visit further afield destinations, with a range of 5,000 nautical miles at nine knots. 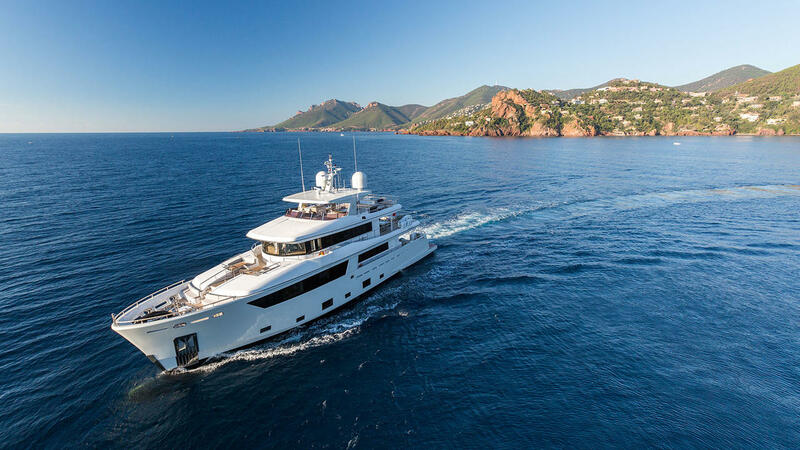 Her interior and exterior design features the work of Nauta Yachts — light and airy Italian décor with sand shades, whitened oak veneer and nature-inspired accents ensure a peaceful and relaxing environment. She sleeps up to 12 guests in five cabins and is perfect for adventuring in luxury. One of her highlight features is a vast sundeck complete with Jacuzzi, optional shading and a bar. With more than 50 square metres of outdoor deck space that includes a standout aft deck with unobstructed views and steps down to a submersible swim platform, she is perfect for enjoy full views of her surroundings. Her extensive toy list includes Seabobs, kayaks, jetskis, a jet surfboard, a 5.5 metre tender and Gocycle bikes for on land exploring. 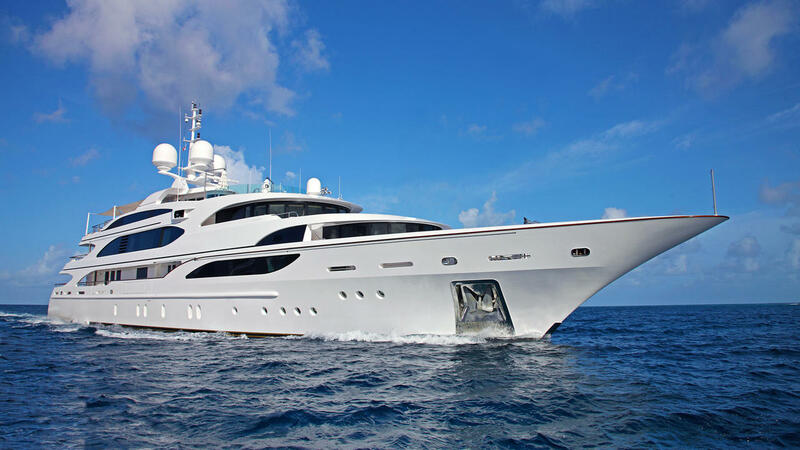 Narvalo is available in the Caribbean and the Bahamas, and her weekly charter rate starts from $115,000. The brand new 25 metre Princess La Vie will be available to charter from Palma, Mallorca next year with bluewater. Delivered earlier this year the compact yacht offers accommodation for eight guests in four cabins. Her spacious master cabin is filled with light and has a separate seating area and a vanity unit. She has another double cabin and a further two cabins that can be made up as either twins or doubles depending on the group. Perfect for those looking to make the most of the Mediterranean sun next summer she has a large fly bridge with an al fresco dining area, a lava brick BBQ and sun pads. La Vie also has a further forward seating area with sun pads which is another great area for sunbathing. The fun continues on the water with a brand new toy box including a three person jetski. La Vie will be available from €49,500 in the low season and has a high season charter rate of €51,500. The 38.72 metre RH3 is now available to charter with Y.CO after completing an extensive rebuild. Delivered in 2003 by RMK Marine she is offered to the market in immaculate condition and features a new layout on her main and upper decks. Her updated design has seen her salon transformed into an open plan area for entertaining and dining, while a new observation lounge on the bridge deck offers breathtaking views and the sundeck boasts on outdoor gym space with TRX station. The collaborative effort behind her interior design comes from Belgian designer Vincent Van Duysen and the yacht’s owner. Fine Italian leather, cashmere, brushed oak, honed Carrara marble and a carefully selected range of natural materials give her a homely feel. The yacht is also home to an impressive on board art collection as well as custom pieces from Van Duysen and bespoke furniture by Christian Liaigre. She still offers accommodation for 10 guests in five spacious cabins, including a full beam owner’s suite. She also has a crew of eight. She offers a vast collection of water toys, including a custom 15 metre expedition chase boat RH4, two 6 metre Madera RIB tenders, scuba gear, seabobs, kayaks, custom paddleboards, a slide and trampoline. RH3 has been designed with exploration in mind and has a range of 3,000 nautical miles at 10 knots and zero speed stabilisers to maintain smooth cruising in all weather. She is available in the Caribbean, the Bahamas and Cuba with a weekly charter rate of USD $140,000. The recently launched 37 metre Gulf Craft Ghost II will be available to charter for the first with Ocean Alliance. 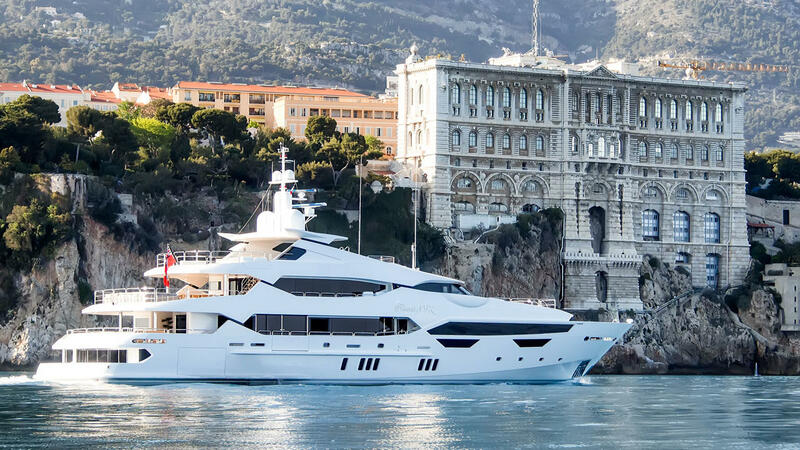 Her new central agents believe she is the first new build charter superyacht on the Australian market and are expecting a high demand for bookings. Based in Sydney Harbour she will be available for both private and corporate bookings. One of the best party charter yachts she can accommodate up to 120 guests for cocktail parties. She can also offer casual buffets for up to 100 guests or formal dining for 60. The yacht will be focused on offering a “truly Australian” experience with a focus on using locally sourced food. Ghost II also has accommodation for up to 12 guests for longer charters. Her vast deck spaces offer plenty of space for guests to enjoy the Australian sunshine while her extensive toy box will keep guests entertained in the water. She also boasts a wonderful Jacuzzi for relaxing in and enjoying a sun downer. 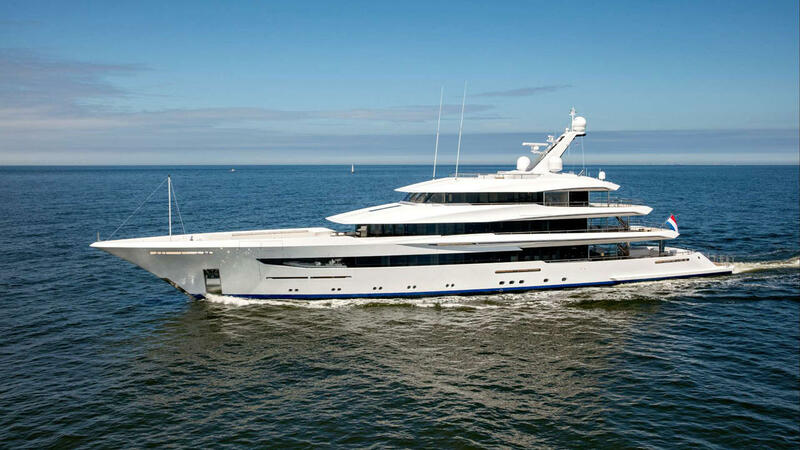 Delivered in July 70 metre Feadship Joy is now available to charter with Burgess. 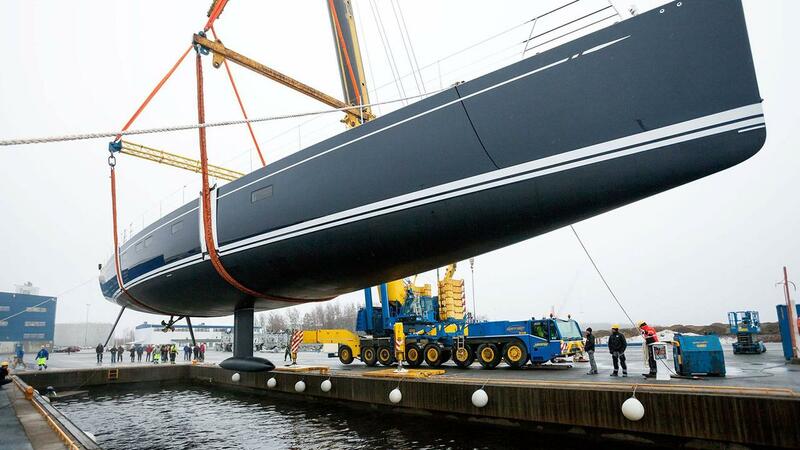 One of the coolest new superyachts this yearJoy is a collaboration between the Dutch yard and Bannenberg & Rowell. Her owner was Feadship’s youngest to date and as such as brought a fresh perspective to her design. There is a focus on combining indoor and outdoor living with unique features such as “winter gardens” — which are specially air conditioned pockets. She is packed with all the amenities you would expect form a yacht of her class including a large gym, spa room and an on board masseuse. To add to the fun her expansive beach club can be converted into a disco and she has a games deck. Joy’s vibrant interior offers flexible accommodation for up to 12 guests with an eight cabin configuration, while a superyacht elevator links three of her five decks. With a crew of 17 all guests are guaranteed an excellent level of service. There is also plenty to keep guests entertained on the water with a vast array of toys available, including an 8 metre water slide. Joy is available in the West Mediterranean before crossing to the Aegean from where she will then head to the Indian Ocean. Her weekly charter rate starts from ?€600,000. 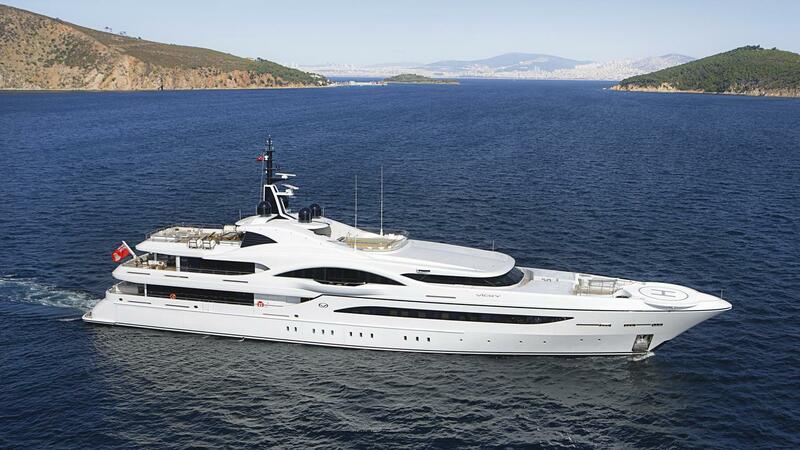 Delivered last year 11.11 is available to charter for the first time in Mediterranean with Y.CO. The 63 metre Benetti stands out from the crowd thanks to her striking profile. 11.11’s bold aesthetics continue with her Art-Deco inspired interior. Created by the owner’s personal design team, the spacious layout features stainless steel finishes, Italian marble and bespoke chandeliers complemented by bold artworks. She offers accommodation for 12 guests and 16 crew across four decks. Her master suite is particularly spectacular offering 180 degree views across a private sun deck with a large jet pool and sunbathing space. Her deck spaces are perfect for entertaining or just relaxing in the Mediterranean sunshine. The main sun deck comes complete with a jet pool, Italian stone bar and a spa area complete with a massage and steam room, while her skylounge has a cocktail bar which opens onto a further entertaining area with a 14 seat dining table and another outdoor bar. As you would expect 11.11 is also packed with a great selection of the newest water toys including Seadoos, Seabobs, kayaks, towables and inflatables. 11.11 is available to charter and has a weekly rate of €650,000. 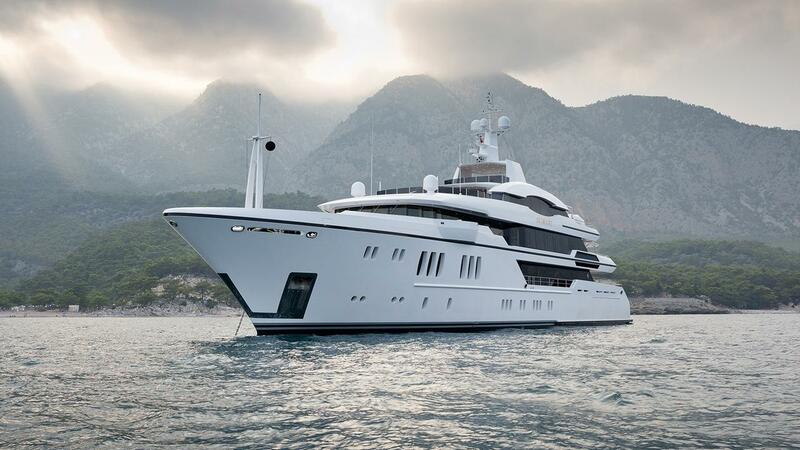 Brand new 50 metre Ouranos is available to charter in the Mediterranean. Admiral delivered the first C Force 50 model to her owner earlier this month and she has immediately been made available for charter. Her bright interior was designed by Admiral Centro Stile and her double-height central window allows light to flood into the main and upper deck saloons. The entire interior has been designed with the motto “less is more” in mind and has a sophisticated and spacious feel. She can comfortably sleep 12 guests and features a spacious master cabin on her main deck. Other accommodation is offered in three double and two further twin cabins. She also offers great deck spaces for enjoying the Mediterranean sun. Her sun deck is particularly spectacular with a Jacuzzi, a large dining table and bar. She has a crew of 12 led by Captain Theo who are ready to give guests an “unforgettable time”. She is also a great yacht for foodies as her crew includes two chefs. Ouranos is also packed with the latest water toys including a jet pack and two jet surfs. She has no fewer than three tenders including a 5.3 metre Zar which has been custom made for watersports. Ouranos is being offered for charter by IYC and has a weekly charter rate of €210,000. Delivered in 2009 59.3 metre Lady Luck is being offered for charter for the first time. 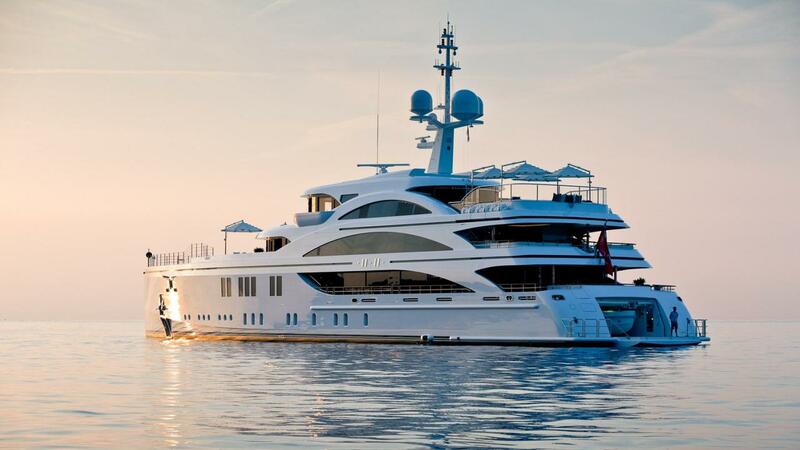 The Benetti motor yacht was formerly known as Lady Lara and has been meticulously maintained. She features opulent interiors by Fendi with every detail considered throughout from lighting to fabrics. The highlight of her luxurious design is arguable her gold plated lift which is covered in 24 karat gold and connects all the decks. Lady Luck offers accommodation for 12 guests in six cabins consisting of five double cabins and one twin. Her stunning master suite, with a gold and crème colour theme, offers 270 degree views as well as private relaxation area. While her crew of 15 can ensure you every need is met during your charter experience. Lady Luck is a great option for those looking to stay fit while on vacation as her sun deck has an air conditioned gym complete with a technogym, exercise bike, treadmill, power plate and free weight rack. If you are looking to relax after your work out then she also boasts a Jacuzzi and sauna. Her flexible deck space has plenty of areas for taking in the Mediterranean sun and alfresco living with three different outdoor dining areas and a fabulous lounging area on her sun deck. There is also plenty to keep everyone entertained on the water as she an extensive toy box as well as two Pascoe tenders. Lady Luck is being offered for charter by Y.CO in the West Mediterranean and her weekly charter rate starts from €315,000. Delivered last year by Nautor’s Swan 35.2 metre Solleone is available to charter for the first time. 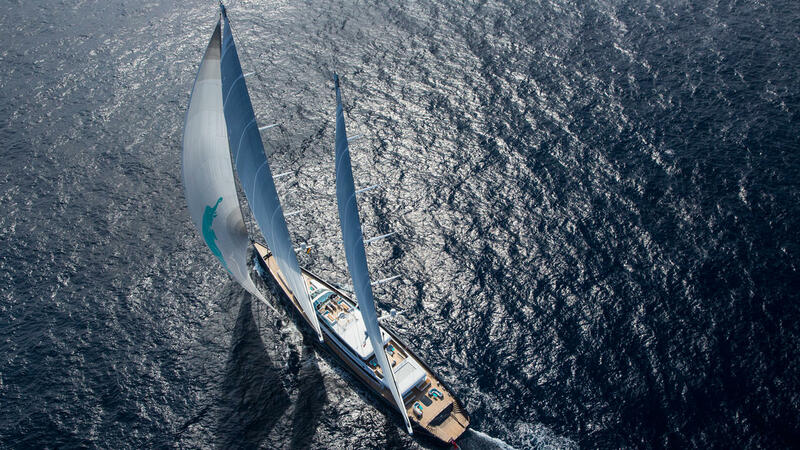 Every inch the modern high-performance racing yacht Solleone is available in the West Mediterranean. Her design by German Frers means that she delivers excellent performance whether you are a demanding sailor or looking to enjoy a more relaxed Mediterranean experience. Her bright and spacious interior offers accommodation for 10 guests in four cabins. Her full beam owner’s suite is located aft on the lower deck and has a large lounge area as well as a his and hers en suite bathroom. She also has a crew of five to enhance both your charter and sailing experience. Her cockpit area can be used for either cocktails or dinners, with adjustable tables that can also be transformed into a sunbathing area. While the deck saloon provides a more formal dining option for up to 12 guests. Solleone’s summer weekly charter rate is €80,000 during the low season and €95,000 during the high season. Delivered earlier this year vast sailing yacht Aquijo will be available to charter in the Mediterranean. The 86 metre yacht is the result of a collaboration between Vitters and Oceanco and is the third largest sailing yacht in the world. The tri-deck yacht combines exhilarating sailing with all the luxury amenities that you would normally expect to find on a motor yacht. Dölker + Voges is responsible for the comfortable and modern interior which offers accommodation for 10 guests in seven cabins. Her exterior spaces are equally impressive with a huge aft deck that offers dining for up to 20 guests as well as a BBQ setup and an indoor/outdoor bar. Guests have instant access to the water thanks to her swim platform and can enjoy a stunning beach club which features a steam room and sauna as well as large hot tub with views across the sea. Aquijo also has a great selection of watertoys including kayaks, paddle boards, two sailing dinghies, eight sets of dive gear and a selection of wakeboard and water-skiing equipment. As well as her luxurious features Aquijo has also been designed with sailing performance in mind. Vitters developed a custom steering system for the yacht, which was created to give the helmsman the same immediate “feel” as on smaller yachts. Perfect for the sailing fanatic Aquijo is offered for charter by Y.CO and her weekly charter rate starts from €400,000 per week. Fresh from her launch at Germany’s Abeking & Rasmussen yard, the 72.5 metre motor yacht Cloudbreak is the newest addition to the world’s charter fleet. She will be embarking on a complete circumnavigation and will be available for charter en route, starting with British Columbia. 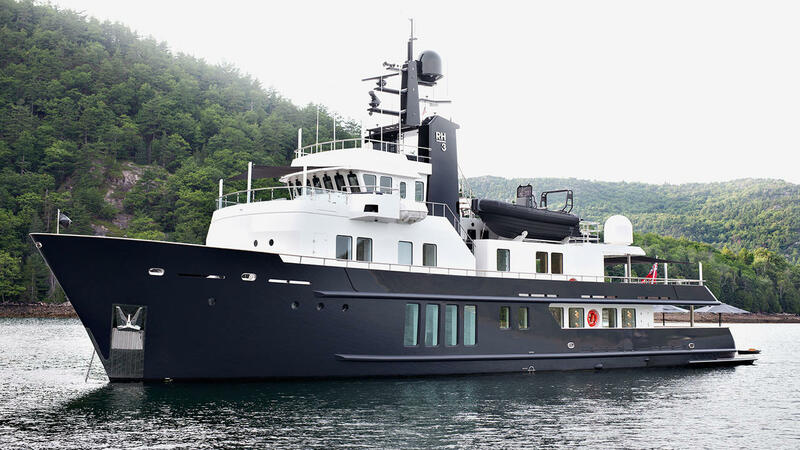 Built in steel and aluminium to a design by Espen Oeino, she features an exquisite interior designed by Christian Liaigre to accommodate 12 guests in six cabins including a full beam master suite with a sea balcony. There are also quarters for up to 22 crew, ensuring an excellent crew to guest ratio. Throughout, the emphasis is on breaking down the boundaries between interior and outdoor spaces and the bridge deck saloon has huge glass partitions that open to ensure a seamless flow from the saloon to the aft deck. Special features include a helicopter pad, a health and wellness spa, swimming pool on the foredeck, a beach club and an elevator through all decks. A wide range of water toys includes two tenders, four jet skis, four SeaBobs, kite and wind surfing boards, eight sets of scuba diving gear and a selection of towables including water skis. 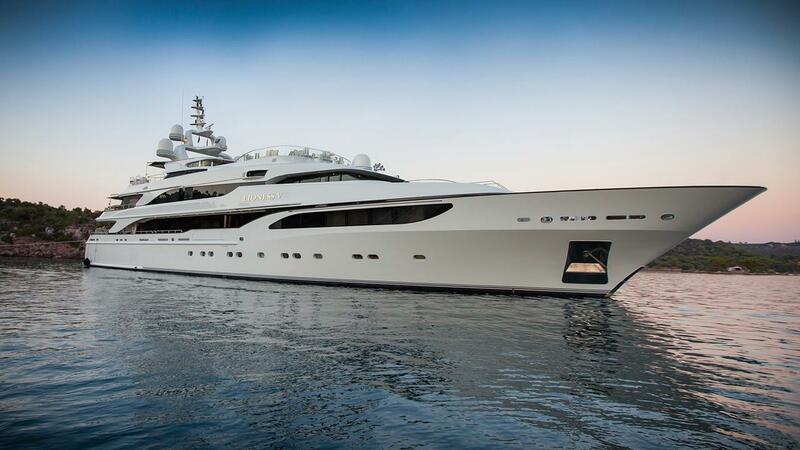 Cloudbreak is offered for charter by Super Yachts Monaco at €750,000 per week. Only launched in January this year 47.25 metre Princess AVK is one of the best yachts for charter in the Western Mediterranean. 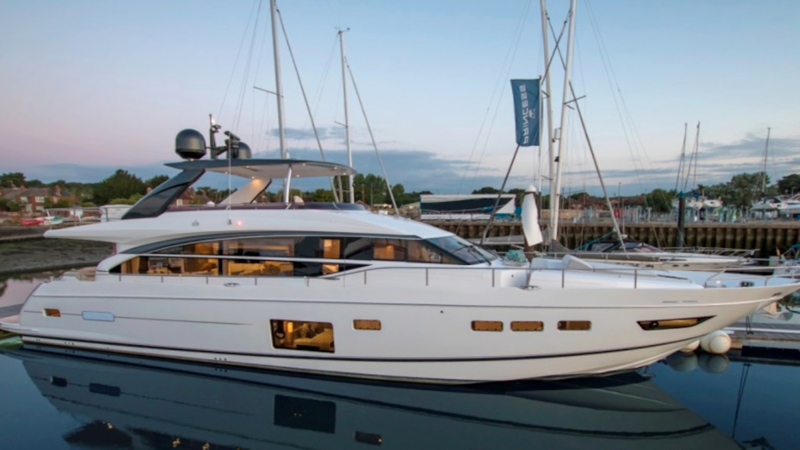 The brand new yacht is only the second Sunseeker 155 ever launched and is packed with the latest technology and facilities to please every charter guest. Princess AVK offers accommodation for 12 guests with a flexible six cabin layout. Both the master and VIP cabin are packed with natural light thanks to the floor to ceiling windows which offer unparalleled views out to sea. The feeling of light continues in the main deck saloon, which has fold down balconies on either side. She also offers fantastic deck spaces with multiple areas for al fresco dining and relaxing in the sun. Her main deck offers a comfortable seating area aft, while her bridge deck has a large dining table, which can comfortably accommodate 12 guests. Her sun deck has a more informal dining area with a large bar, BBQ grill and spa pool. All of the furniture on the sundeck is moveable so can be altered to guests requirements for entertaining. She also provides a great selection of water toys for those looking for an adrenalin rush. As well as the usual favourites, such as jetskis, waverunners and seabobs, she also has a flyboard, air chair and three different kinds of wakeboard. Her beach club features a shower and sauna — perfect for relaxing and refreshing yourself after fun on the water. Princess AVK will be based in South of France, with a Spanish charter license, and is also available in the Balearics. She is managed for charter by Camper & Nicholsons and her weekly charter rate starts from €210,000. 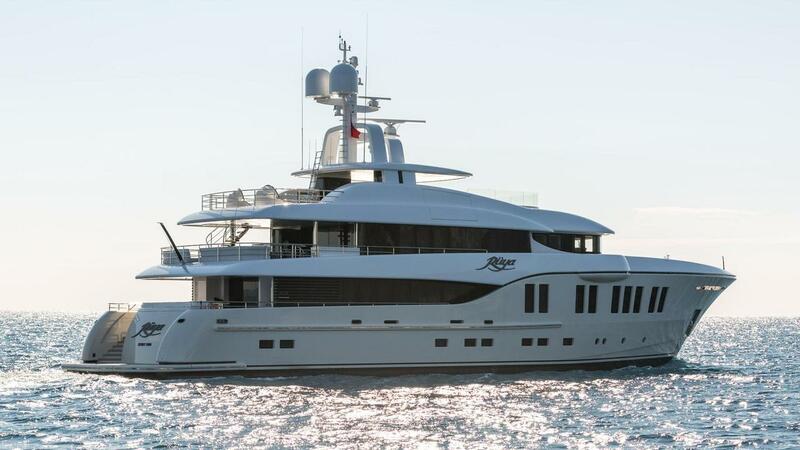 Delivered earlier this year 41.4 metre Rüya is available to charter for the first time in the Western Mediterranean. Built by Alia Yachts voluminous Rüya won two awards at the 2016 ShowBoats Design Awards. Her interior, designed by Australian Sam Sorgiovanni, picked up the Interior Layout & Design Award and impressed judges with its compact five-stateroom layout and smart flow for excellent crew service. Following the owner’s brief the interior is inspired by the Australian outback and uses materials like bamboo and Australian silky oak. There is accommodation for up to 12 guests in three double cabins, two flexible double or twin cabins and two additional berths. Rüya’s outdoor spaces are equally impressive and perfectly suited to offer guests luxury al fresco living. She has a huge 93m2 sun deck which features a bar, barbeque, 10-man jacuzzi and gym equipment. There is also plenty of opportunity for fun on the water as Rüya’s aft storage hatches open to create a practical sports area with a spacious swim deck and on-water beach club. She is also equipped with the latest must-have water toys — including a sailing dinghy, two Sea-Doos, two inflatable kayaks, two SeaBobs and two stand up paddle boards. Rüya is available for charter with Burgess and her weekly summer charter rates start from €154,000. Brand new Nautor’s Swan 115 Shamanna, that was only launched this month (April 21), will be available to charter in the Mediterranean. 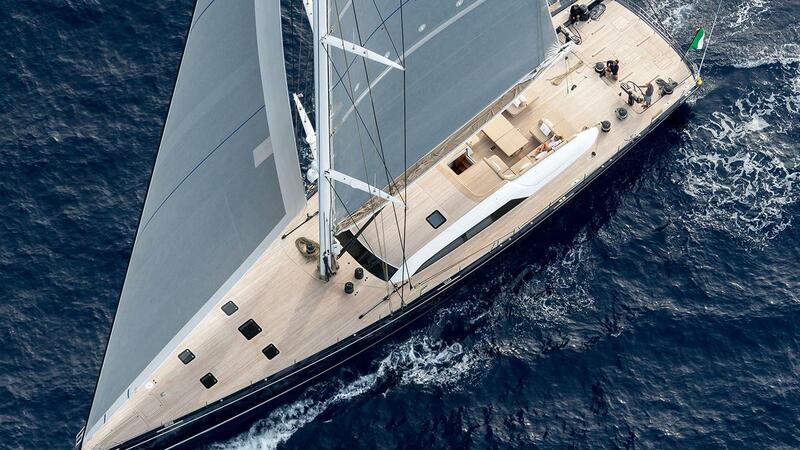 The 35.20 metre sailing yacht has naval architecture and exterior design by German Frers and is the second hull of Nautor’s Swan flagship 115 series. Shamanna promises to offer serious comfort without “jeopardising speed and racing performance”. Shamanna’s Scandinavian-style interior has accommodation for eight guests in a well-appointed master cabin, a double cabin and two twin cabins with Pullman berths. All cabins have spacious shower en suites. She also features air conditioning, stabilisers at anchor and WiFi connection. On deck she offers excellent sea views with a large forward cockpit seating area and comfy beanbags and seats to enjoy the Mediterranean sun. There is also plenty to keep you entertained on the water as Shamanna comes equipped with inflatable kayaks and two stand up paddleboards, while her powerful Williams Sportjet 460 tender is perfect for waterskiing and wake boarding. Although the yacht is brand-new she comes with an established crew of five that have moved with the owner. As well has having a reputation for providing excellent charter service the crew are also and passionate and experienced sailors. Shamanna will be available to charter through Edmiston and her weekly charter rate starts from €68,000. If you are looking for an unforgettable exploration experience then take advantage of recently rebuilt 77.4 metre Legend being available to charter. After emerging from Icon Yachts earlier this week (28 March) Camper & Nicholsons has announced that Legend will now be available for adventurous charterers. Originally built as a Soviet military A Class 1 icebreaker in the 1970’s Legend was transformed into a superyacht by her previous owner. Her latest refit has now seen everything except her hull and main engines changed to turn her into an exploration vessel that can go to the world’s most incredible ice destinations. As part of the improvements there has been a 3.6 metre extension to her stern and additional deck spaces have been added. There is new crane equipment for a great selection of water toys and she comes equipped with a submarine for underwater exploration. 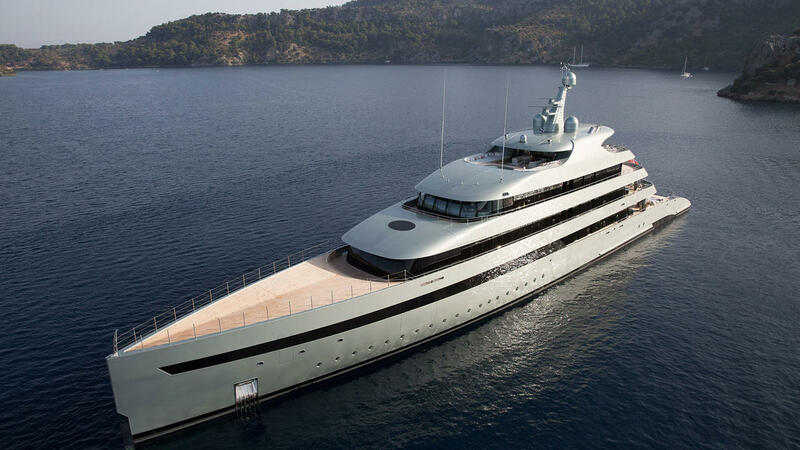 She also now has a fully-classified helicopter deck, a new swim platform, large swimming pool and Jacuzzi. Her luxuriously re-designed interior by Thom Beerens offers accommodation for 26 guests. The fresh design is packed with facilities including a fitness area, movie theatre, and medical suite. There are also great areas for socialising with a large formal dining area and bar. 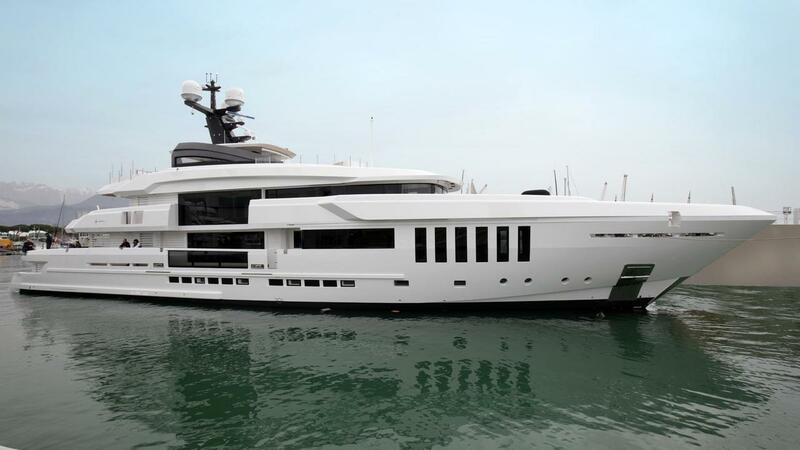 “I wanted to create a vessel that could go anywhere in the world, but also provide the luxuries that have become standard in the superyacht industry,” says owner Jan Verkerk. Legend is available to charter through Camper & Nicholsons with prices starting from €455,000 per week. The 39 metre motor yacht Taransay, delivered in Spring 2015, will be available for charter in the West Med for the first time. Her story is an intriguing one in that the owner, having chartered the classic refitted yacht Ocean Glory for a number of years, decided he wanted his own classic yacht. Rather than refit an old yacht with all the pitfalls that involves, he commissioned Italian yard Rossinavi to build him a new replica yacht in steel and aluminium. Thus Taransay has all the outward looks of a 1930’s classic but her interior boasts all the latest comforts and equipment. The interior, by French designer Alain Tassin, is rich and classic with exposed deck beams, wooden paneling painted with a delicate white satin lacquer, and exquisite fabrics. Accommodation is located on the lower deck and is configured as five cabins sleeping 10 guests. These consist of a full beam master suite, a VIP suite and twin cabin forward and two further twins aft, all with entertainment centres and marble en suite bathroom facilities. The main saloon is comfortable and relaxing with white mahogany paneling while the galley has all the latest appliances and a large wine cooler, suitable for preparing gourmet meals. Outside areas are generous and include full walk around decks on both levels and a vast upper deck offering an al fresco dining experience on L-shaped sofas to port and starboard with height adjustable tables. Twin diesel engines give her a comfortable cruising speed of 12 knots and a range of 3,500 nautical miles at 9.5 knots. Taransay is available for charter through Camper & Nicholsons at rates from €90,000 per week in high season and €80,000 per week in low season. 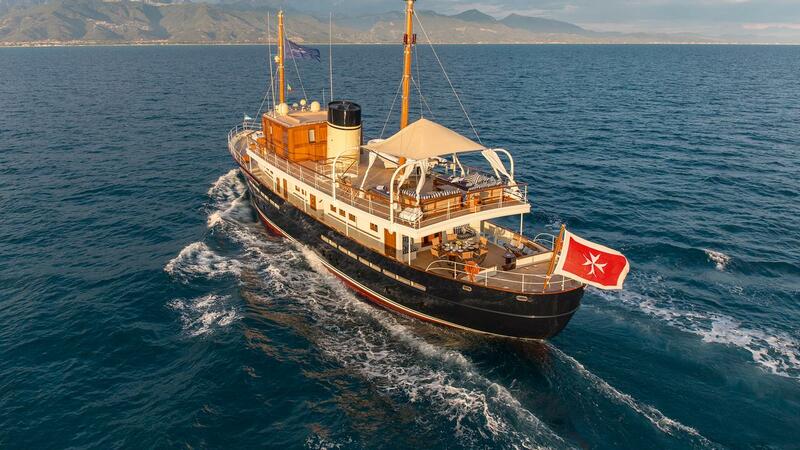 Award winning Vicky will be available to charter for the first time in the Mediterranean. Vicky, who was the largest Turkish-branded yacht when she was launched in 2012, in an exciting new addition the charter fleet. The 73 metre motor yacht has a host of areas for entering and relaxing including a double-height atrium, a separate formal dining area and a cinema. Add to this impressive features such as a large tropical fish tank and a grand piano and Vicky is bound to impress. Vicky’s spa is another stand out feature with a gym, steam room, massage room and a four meter fold down sea terrace. Completely refitted in 2014 she is being offered in immaculate condition for charter and can accommodate up to 12 guests in seven cabins. Her owner’s stateroom is spectacular with its own private deck and balconies on both sides. Her exterior spaces are equally impressive with a wide range of areas for relaxing and al fresco dining. She also boasts a splash pool with jacuzzi features, a stunning beach club and sea terrace. Vicky is also one of best party charter yachts as she has a DJ station with lighting integrated into her sun deck bar. There are also plenty of opportunities for fun on the water as she is equipped with four tenders. She also has a selection of jet skis, sea bobs, water slide and a variety of towables. Vicky is managed for charter by West Nautical with her weekly charter rates starting from €550,000. Vicky is also currently for sale asking €62,500,000. The recently delivered 63 metre motor yacht Irimari is now available for charter through Ocean Independence. Irimari, the adventurous new Sunrise built for fun, was designed by Espen Oeino. She accommodates 12 guests in six cabins consisting of a master suite, VIP suite, two doubles and two twins, all with entertainment centres, WiFi internet access and en suite bathroom facilities. She has a stunning bleached-oak and copper-strip interior designed by Focus Yacht Design of Bremen in Germany and is a full-displacement motor yacht capable of cruising at a transoceanic range of 5,000 miles and reaching a top speed of 17 knots. A complete tour of her six decks totals around 280 square metres and her amenities include a cinema in the upper salon with a 90 inch television screen, an interactive games room and a piano. The sundeck offers one of the best superyacht pools and a wet bar along with several sun pads while the huge transom door opens to create a beach club complete with sauna and gymnasium. A dedicated complement of 18 crew members under Captain Heimo Tauen are on hand to give instruction on a range of water sports, for Irimari is a designated RYA training centre. Twin 2,000hp MTU engines give her a comfortable cruising speed of 15 knots and she is fitted with zero speed stabilizers to eliminate roll motion in port and under way. A huge range of water toys includes three tenders, two Yamaha jet skis, two SeaBobs, two SeaDoos, snorkeling gear, two sea kayaks, an inflatable water slide and an array of towables. Irimari is available for charter at €490,000 per week in high season and €460,000 per week in low season. The 63.5 metre motor yacht Lioness V (ex Lionheart) is newly available for charter in the East and West Mediterranean. Built by Italian yard Benetti and delivered in 2006, she is reputed to be one of the most highly specified yachts built by the yard. Luxurious accommodation is for 12 guests in six cabins consisting of a main deck full beam master suite, three doubles and two twins, all with en suite bathroom facilities. The saloon is massive, with a lounge area fitted with comfortable furniture, an entertainment centre and bar, while forward is a separate dining area with seating for 12 guests. Further forward still is a cinema and the master bedroom suite. Outdoor spaces are plentiful and include a large aft deck for al fresco dining leading down to the beach club and swimming platform offering a fully equipped gymnasium and hammam along with a tender garage. A special feature is the swimming pool on the upper deck, surrounded by sun pads and concealed speakers to set the mood for relaxation. The aft bridge deck has another full bar plus dining facilities for up to 14 guests while the bridge deck saloon has a cosy lounging area, a media room and yet another bar. A professional crew of 18 led by the experienced Captain Jon Armstrong are on hand to ensure a memorable holiday. Water toys include two tenders, two jet skis, two SeaBobs, an inflatable water slide and a wide range of towable toys. Lioness V is available for charter at rates starting from €425,000 per week through Camper & Nicholsons.